If ever you decided to play a PC game when you’re hungry or even slightly peckish, stay away from Burger Shop 2! 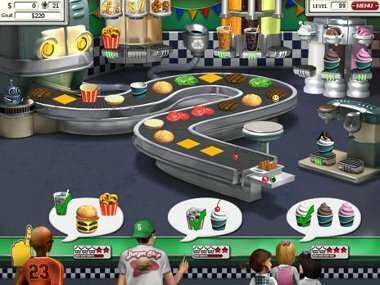 This super fun and fast paced Time Management game will have you drooling in no time or making a run for the nearest diner in town, ready to fill your belly with burgers, fries and chocolate cake! In the previous title Burger Shop your aim was to get your hands on the blueprints for the BurgerTron2000 burger-making machine and use it to start a successful business. Those were amazing times, but as Burger Shop 2 begins, you awake to find yourself in a dumpster with a bump on your head and no memory of where you’ve been. Not only that, it appears that your restaurant chain now belongs to some dodgy character who offers to sell it back to you for a low price. As no other explanation presents itself, you decide to take him up on his offer and so begins the quest to build yourself up from scratch and restore all eight restaurants in your chain to their full glory. 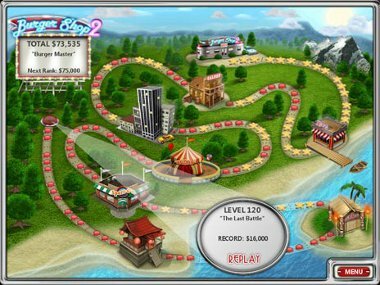 Burger Shop 2 begins in Story mode and as you progress you can unlock additional modes like Challenge, Relax and Expert. Your job is to serve customers as quickly as possible while keeping an eye on the oven, fizzy drink machine and the fryer. The quicker your serve, the larger your tip; some customers are quite generous too, tipping a whole $6… not bad! Customers will order anything from grilled chicken or steak to curly onions or French fries. 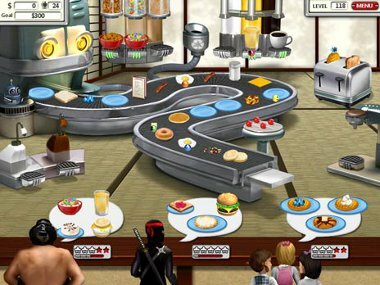 Between each level in the game you get to choose what dishes you want to add to your restaurant and each dish comes with its own recommendation; should you go for waffles (these are an action packed thrill ride compared to boring white bread), large onion rings (which, in case you are planning to propose to your loved one, you can use as a ring!) or perhaps tomato soup (which even in the summer tastes yummm). While preparing food and serving in Burger Shop 2 you must bear in mind your customer’s level of patience; The Dude and the Mime are very easygoing and don’t really care what you serve them, whereas the Dog Lover is slightly unpredictable and can run from being laidback to extremely anxious. Luckily you have a few tricks up your sleeves to calm the crowds and guarantee high tips; a Lollipop to pacify patrons, a dog biscuit for their pets and even a tranquil tune on the Jukebox. As each level progresses you move up in the ranks. You start out as a simple burger flipper but you can move up to Fry Oil Disposal Technician and even Assistant to the Assistant to BurgerTron – can’t beat that, right? Burger Shop 2 has a great storyline and quirky sentences thrown in-between levels. Add that to the bright visuals and fun music and you get a super addictive Time Management game, which you cannot stop playing for love or money… unless of course it’s the delivery guy with your food order! 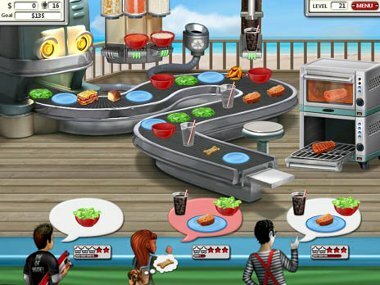 Download and play Burger Shop 2 for FREE! I’m not sure if I’m really cut out for this game but I’ll try it. no entiendo el ingles, solo se hablar en español. entonces no puedo entender lo que me quieren explicar.me gustaria que me escribieran en español. Very good game; timing was a little difficult to achieve. great games to play ! Can,t wait to start playing! the first Burger Shop is awesome, so I bet Burger Shop 2 is even awesomer!!!!!!!! my friends say they love this game so i will be trying it myself. I play this game alot. It is fun and sometime it gets hard. Put it is fun to play. I don’t give up and keep go back over it. I am hooked. I cannot get enough of this game. Very good game, timing was a little difficult to achieve. yes i would love to play this game.